When one to four players find themselves marooned in the harsh wilderness, you must cooperate and compete to search for the water, food, and tools that will be essential to your very survival. But your adventure holds many secrets. Every copy of Discover: Lands Unknown is unlike any other in the world. A mix of environments, storylines, characters, locations, items, and enemies have been engineered to tell a story unique to every copy of the game. What unknown secrets lie within? Your own unique group of survivors must work together to find a way home. 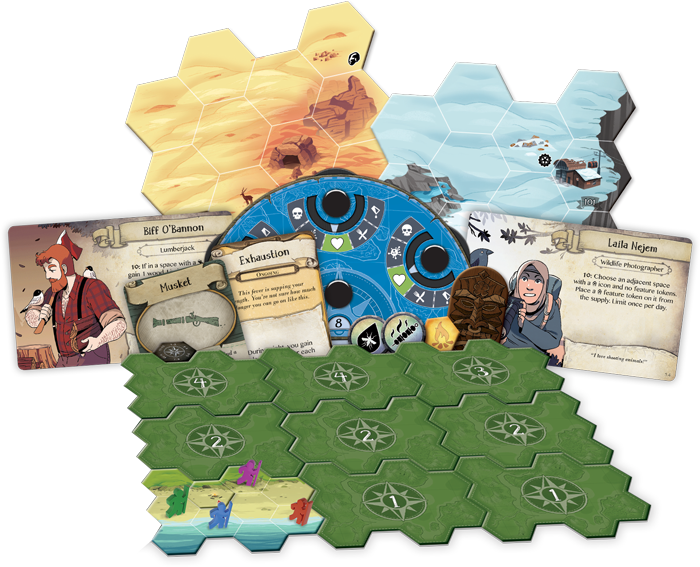 Discover: Lands Unknown sees you and your friends cooperating and competing to survive. When you awaken, the way home will not be clear. You’ll have to scrounge for food and water, tangle with dangerous creatures, gather resources, craft new items, and more if you have any hope of escape. 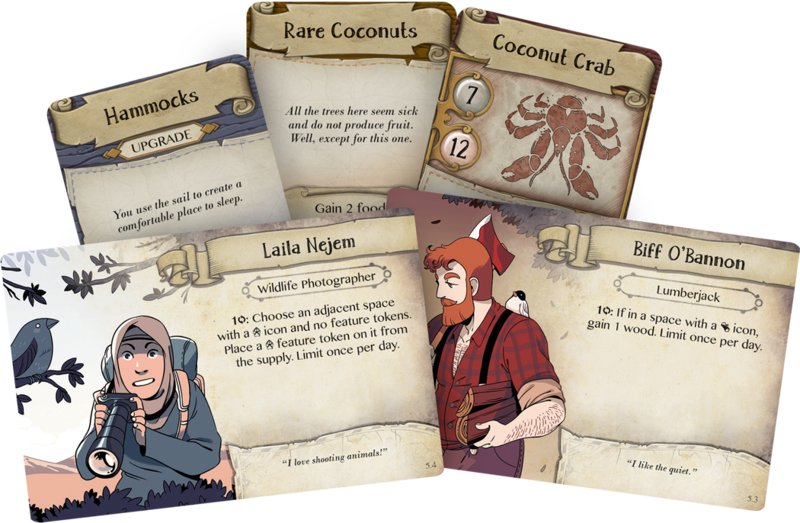 Every game of Discover: Lands Unknown will have multiple scenarios associated with it, each made up of a number of quest cards. These cards provide your survivors with a simple goal—such as exploring a landmark or defeating a wild animal. Once these objectives are completed, a new quest card is revealed! Eventually, by completing quest cards, you may uncover a way for you to escape! But when the path is found, will you all leave together, or is it every survivor for themselves? 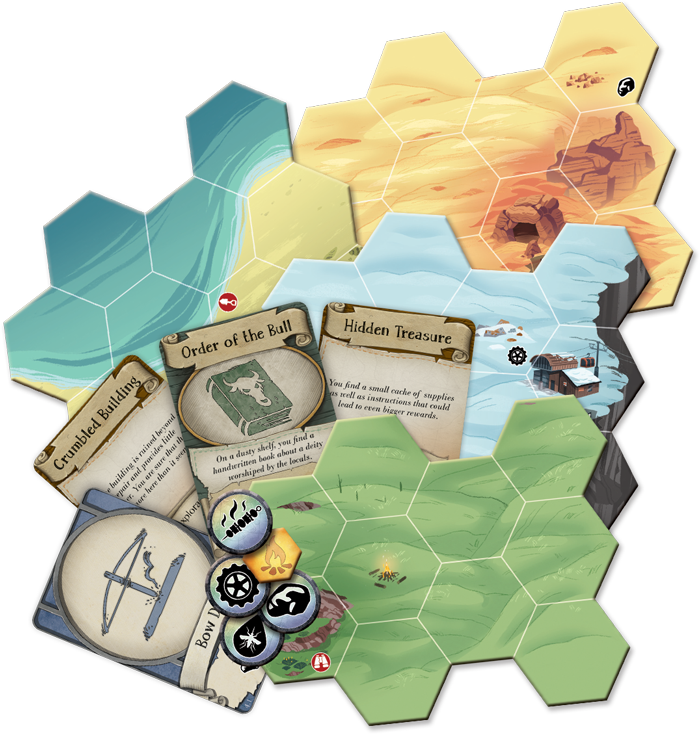 Discover: Lands Unknown is one of Fantasy Flight Games' first Unique Games. What is a Unique Game? In a nutshell, it's an entirely new type of game! Unique Games can take many different forms, but they share one thing in common—every copy of the game is unique. The copy that you pick up off the shelf will have different components than the copy your friend gets at their store. While mechanics and some common components will be the same in every copy of Discover, the vast majority of the cards, tiles, and tokens in your box will be randomized, selected from a vast pool of possible components. 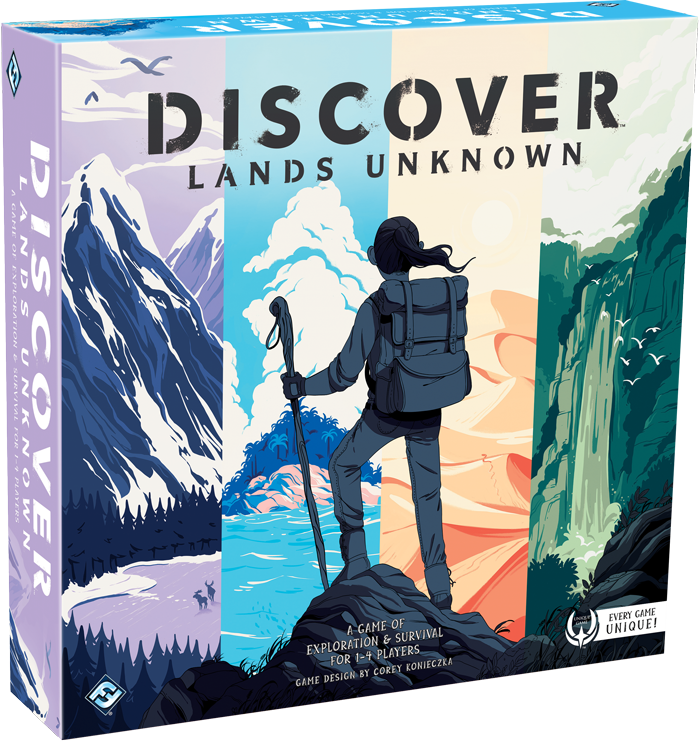 When you open your copy of Discover: Lands Unknown, you can never be sure what you'll find inside, and the combination will be different from every other copy in the world. In other words, Unique Games aren't like Legacy Games, which start with identical components, but become unique through gameplay. Unique Games have their own distinct mix of components in every box!